Luna has been performing hula hoop nationally and internationally since 2006. She has a background in dance-hoop, fire performance, aerial arts and modern dance. Luna is best known for her creative integration of multi-hoop formations, acrobatic hoop tricks, and rhythmic stunts. A truly impassioned artist, with the ability to steal the the stage her presence, she always wins the hearts of her audiences. Luna has traveled to India via Samsung Mobile to promote the Olympic games through performance, performed at the 2014 IJA Cascade of Stars, and has worked with acclaimed contemporary circus companies such as Pendulum Aerial Arts, Quixotic Fusion, Madison House, Periplo Circus Convention, and many others. In 2011 she was visionary and co-founder of MoonDrop Circus, a thriving community circus based in Kansas City, Missouri. In 2013 she completed a professional circus training program with one of the most highly acclaimed contemporary circus companies in America, Pendulum Aerial Arts. There she worked one on one with world champion rhythmic gymnast Rebbecca Sukhanova. Maggie Walker and David Gallina are Groove Catalyst, a KC-based hoop dance duo. They discovered hooping through the music festival scene while living in Boston years ago, and have spent the past several years traveling all over the country to attend hooping retreats, flow festivals, and movement workshops, learning from some of the best hoop instructors and performers in the world. Maggie and David were recently members of the 2014 Electric Forest Hoop Troupe. They performed with MoonDrop Circus from March 2013 through January 2014 and are now residing in Seattle where David is participating in a chiropractic program. Jared began juggling in 2001. Since 2003 Jared has attended over 60 juggling festivals in dozens of states including multiple IJAs and an EJC. At these juggling festivals Jared has taken and taught countless workshops on many types of juggling. He has worked as a juggler at Renaissance Festivals in Maryland and Arkansas. As well, he has performed at juggling festivals in Arkansas, Iowa, and Nebraska. In 2009 he met a very unique group of jugglers in Kansas City- the Kansas City Juggling Club. Jared liked the group and Kansas City so much that he got a job teaching at an inner city elementary school and moved to KC. 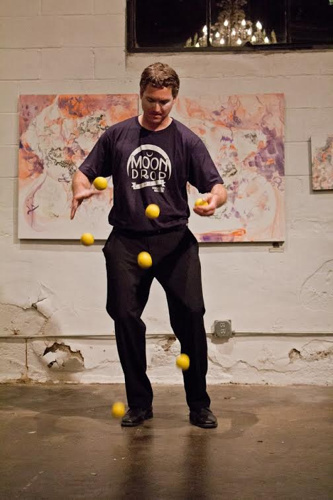 In December of 2012 MoonDrop invited him to perform his bounce juggling act at their First Friday show. He continued modifying and performing this act at First Fridays with MoonDrop until May of 2013. Jared cherished his time with MoonDrop, and learned a lot from the experience. He wishes them nothing but the best in their future. Jenna Haddock, stage name Iris Flipance (goddess of the rainbow) started performing at a young age as an all-around competitive gymnast and then onto her high school dance team, show choir (yes, like Glee! ), theatre and sports. At the University of Missouri Jenna continued to dance with the Golden Girls Dance Team while graduating with a master’s degree in Occupational Therapy. In 2011 Jenna learned about aerial silks at Quixotic from Megan Stockman and found a new love of flying and trains in silks, lyra and trapeze. Jenna has trained across the US and into Montreal honing all her aerial skills along with acro, ballet and modern dance. In 2012 Jenna met her role models, teachers and best friends; Robin Rosenberger and Luna Breeze who showed Jenna the magical world of performing arts and family circus. That same year Jenna was honored to perform with Robin at First Fridays. Jenna’s heart will always be tied to MoonDrop which she joined in 2012. Jenna just finished a professional track program in Aerial and Dance at Frequent Flyers School in Boulder, CO. She currently has a contract with Le Reve "The Dream" Show performed at the Winn Hotel in Las Vegas. We are so proud of Jenna! The product of a prominent Italian circus family, David Marker (Born: Davide lo Magnifico) was recognized at an early age as having prodigious talents in the circus arts. Under the guidance of his great uncle, Alfio Spacchioso (famous for inventing the “quadruplo-salto” technique), David developed a strong foundation in basic circus performance, as well as a great musical sensibility and liveliness, which resulted in him being known colloquially as “The Animator.” As an adolescent seeking adventure, David set sail for the new world with $15, a tambourine and a kazoo as his only worldly possessions. Arriving in America he found himself on the streets of Boston’s North End, where he scratched out a living performing street music and reciting epic Italian poems. His quixotic wanderings eventually brought him to Kansas City, where he quickly made a reputation for himself by performing at First Fridays in the Crossroads. A series of chance encounters, shady dealings and romantic forays brought him into the inner circle of MoonDrop Circus. Specializing in exotic instruments such as the zampogna, tamborello, organetto, friscalettu, marranzanu, and chitarra battente, as well as being an award winning whistler, David brings an old-world romanticism to the conventional circus performance. He is currently residing in New York City where he is attending NYU working towards his Master's degree. MoonDrop is very proud of him and look forward to his visits home. Natalie Naema Pierce, also known as Naema MoonFly for her stage name which was given to her as a nickname from friends, has been performing with MoonDrop Circus since December 2012. During her teenager years Natalie took dance lessons in ballet, tap, jazz, and modern. During her senior year in high school Natalie was at a John Butler Trio concert and discovered hula hoop. The beauty and grace that hoop dancers possessed was the world she wanted to live in. Natalie submersed herself in the fantastic flow arts community of Kansas City and short after found MoonDrop Circus. In 2012 she began studying aerial arts on several apparatuses such as aerial silks, hammock, lyra and trapeze. Natalie is also is a fire dancer and fire eater using props such as fire hoop, fire fans, fire fingers and fire eating toys. All of her props are handmade by her and a dear friend in collaboration with each other. Natalie is taking a break from school studying Health Sciences and Spanish to travel and live in Cusco, Peru. Noah is a professional Musician based in Kansas City. He Studied at the Paseo Academy of Performing Arts from 2007 - 2009. He plays in multiple bands, a list that continues to grow due to his ability to play various instruments in a variety of styles and genres. MoonDrop was delighted to have Noah as a lead musician in our 2015 presentation of New Tune at the Arts Asylum in Kansas City and performed in the "Behind the Curtain" show in 2016. Noah also makes a great Bearded Lady. Meara Roach came to MoonDrop as an intern to surround herself with creativity and to learn the world of performing arts in 2013. She began her journey into aerial arts at the age of 13, when she became enamored with the idea of flying. She decided to take a leap of faith by jumping into circus classes, and fell head over heels for trapeze. Now, Meara performs on the trapeze, stilts, as well as training in other circus arts on the side. Meara graduates from High School this month and she will be moving to Vermont where she was accepted as a student at NECCA - New England Center of Performing Arts. Good luck Meara! Abbie Rooney is a performer and teacher in many disciplines, including aerial (trapeze, lyra, silks, and doubles), hand-balance, contortion, gymnastics/tumbling, dancer and hula hoop. 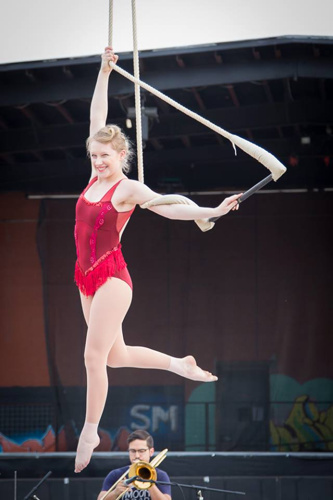 Abbie performs with MoonDrop Circus and is an Instructor/Performer at Quixotic, based in Kansas City, Missouri. Abbie aspires to teach Thai massage and AcroYoga. Some of Abbie’s other loves include traveling, live music, British accents, art, hiking, snowboarding, and Colorado!!! Abbie is currently attending a professional track program at Frequent Flyers in Boulder, CO for aerial dance and acrobatics. Congratulation to Abbie on her new journey! Grace Virant's first year of hooping was spent taking classes with Luna Breeze and mastering what she learned at home. Her first performance in 2013 was at a nursing home, and she was incredibly nervous, but won over the crowd in spades. Since then, Grace has performed at Quixotic School of Performing Arts, Mardi Gras events, World Hoop day in Kansas City, bat mitzvahs, Kansas City Juggling Festival, Halloween parties, birthday parties, and anytime her friends are together and in need of entertainment. She uses fire hoops, LED hoops, minis, a DreamWeaver hoop, and multiple hoops for her performances. Grace has been featured on hooping.org and even competed in Hooping Idol Season 3. Grace also enjoys making and selling hoops through her own small business Graceful Hoops, and making hoop videos. The number one reason Grace keeps spinning in circles is the hoop community she meets at hoop retreats. She has attended Hoopcamp 2013 and 2014, and Spin Summit 2014. Grace currently lives in Denver, CO.
Maggie Walker and David Gallina are Groove Catalyst, a KC-based hoop dance duo. They discovered hooping through the music festival scene while living in Boston years ago, and have spent the past several years traveling all over the country to attend hooping retreats, flow festivals, and movement workshops, learning from some of the best hoop instructors and performers in the world. Maggie and David were recently members of the 2014 Electric Forest Hoop Troupe. They performed with MoonDrop Circus from March 2013 through January 2014. Maggie and David now reside in Seattle.